Businesses: The reason there are so few successful big business owners is that these assets are the toughest to acquire. They require the most mental, emotional and physical power. They are not the best investments for everyone. Real estate. Real estate is a lot more than just purchasing property. It involves financing and management of those assets once acquired. Paper assets, such as stocks. The reason so many people possess them is because they require the least amount of financial literacy, and are fairly liquid. Once you spend some time investigating real estate you’ll uncover the amazing benefits. Some of the reasons why they are the best investments are as follows:. These are just some of the reasons we choose to invest in this type of asset. We feel real estate is one of the best investments out there. Simple Acquisition’s current focus is to acquire cash-flow investments in Charlotte, North Carolina. Two common types of strategies used in real estate. See which we as a company prefer. Ever heard of the old saying that says ‘flippers usually flop’? This type of real estate is referred to as speculation or gambling. You never know what the market will do or what it will cost you to renovate that building. Plus, you don’y always know what you’ll eventually get for it once you’re done. To make matters worse the money you earn when flipping falls in the capital gains category. It’s better than regular income. However, but it doesn’t allow for all the deductions if you were to earn that money as passive income. Hence. not one of our best investment choices. Now, I’m not saying we never flip. Sometimes deals are just too good to pass up. If you have people on your team that are well versed in the tax laws you’ll be able to defer those gains permanently as we discussed on our home page. We are no different than anybody else in that we look for the best investments that provide for the best returns. So, it only makes sense to take advantage of every aspect of this business to maximize those returns. Funds earned from rental real estate is considered passive income. This is the most advantageous type of income you can have. With a good accountant you’ll be able to take advantage of tax benefits to eliminate the tax you’ll pay on this type of income. 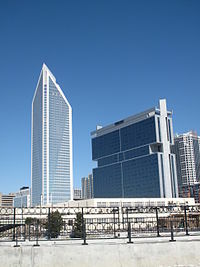 Charlotte, North Carolina is a great metropolitan center that meets the strict criteria that Simple Acquisitions uses to locate viable markets in which to invest. Do you want to know why Charlotte is such an amazing location for cash-flowing real estate? Download your complimentary report now on what makes this city so desirable to investors. Interested in Louisville as a market? Check out our market report below!